“Don’t think about it. Solve the problem. Get yourself out.” (Page 86). Olivia was born with a ghost hand. It’s rare to have PSS (a ghost body part), but Liv isn’t the only one. The ghost hand wasn’t that bad, if you didn’t mind being a freak in the middle of a small town, but after new kid Marcus shows up, the hand starts acting up. 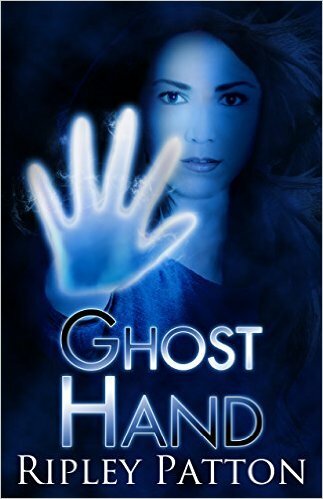 Olivia just wants to live her life, hide her hand as much as possible, but now she can’t. There are people after her who want to forcefully extract her PSS and if she wants to live she’ll have to team up with the new boy and his band of PSSers. I loved the main character, Olivia. She might freak out, as any normal teen under these circumstances should and would, but she doesn’t let that stop her from trying to find a solution. She’s a girl of action. She’s a real superhero and a model main female character. She’s funny, snarky, and thinks fast on her feet. She never lets the situation get the better of her in the end. She may get bad things thrown at her left and right, but she’s always trying to think of a solution and doesn’t wallow in self-pity. She is the strong underdog you’ll love to root for. I laughed out loud more than once! The dialogue between the teenagers is so realistic and the things they say are hilarious! I especially loved and laughed at the scene where Olivia eats some salted almonds. I very much appreciate books where the genders of the main characters could have been flipped and the book would hold true the same way. Olivia isn’t overly feminized or put into a gender corner. There was a romantic element, yes, but Olivia could have been Marcus as easily as Marcus could have been Olivia. I like the way Patton wrote this book the way it is written because I loved Olivia as a strong female lead. Marcus was also a strong character and a strong person, but his role was not as large as Olivia’s. She was the protagonist of the story. Thank you, Ripley Patton for giving us more than just the usual paranormal fare. I was intrigued and fascinated throughout the entire story with Olivia’s ghost hand and the whole concept of “PSS” and I didn’t even mind not getting a thorough explanation for how PSS came about. Sometimes things are just unknown. I loved how this PSS concept is fully developed in this book and the characters discover more about it at the same time as the reader, so we gain a full understanding (but not right away). I believe there’s more to PSS than we know about from the first book and I wholeheartedly await reading more about PSS and hopefully Olivia, Marcus and the gang of PSSers in book two and beyond. This novel was published by Ripley Patton on November 28th, 2012 and is available on Amazon here.